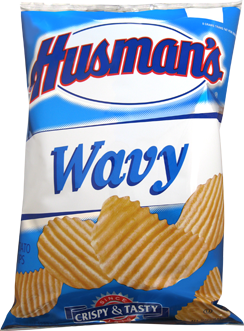 Wavy isn't a flavor, but Husman's have been around since 1919, so they are entitled to present their Potato Chips bags as they see fit. We would presume the lack of flavor means they are plain and original, and the selling point is the texture. The blue is bold and differentiates itself from the other flavors, but it's all bit basic. These Wavy Potato Chips produced a much crispier crunch than the regular Chips. This may have been because of additional thickness, but was certainly contributed to by the design. Medium width Ridges, hence presumably, the 'Wavy' description. Predominantly, the Chips maintained their shape and were whole. The style of Chip also meant that they were slightly thicker than the regular Chips. There was less visible oil and the seasoning was minimal. A plain Chip is a plain Chip. There is a nice balance between salt and potato, but in reality, these will not make the majority of Chips fans sit up and say, "Hey, we must get us some plain and regular, Wavy Husman's." A bit more character about them if accompanying a sandwich than a regular Chip.